As the global best-selling and award winning Jabra Elite 65t true wireless earbuds come to Malaysia, Jabra is offering you the exclusive opportunity to pre-order your unit (or units) with selected local retailers from March 15-April 8 2018. The “Try Before You Buy” campaign, happening nationwide is part of Jabra’s continued effort to deliver the unique, superior experience of Jabra true wireless innovation to consumers. Designed to delight, the Jabra Elite 65t brings a distinct focus on the voice experience –delivering superior audio quality for calls and music without wires. Building on the success of the Jabra Elite Sport – the best-selling, most technically advanced true wireless earbuds – the Jabra Elite 65t is engineered to deliver an even better voice and music experience as well as incorporating new design and colour choices. It was selected as a winner of the CES 2018 Innovation Award which was held in Nevada, United States in January 2018. Confident of its superior quality and overall value proposition, Jabra is inviting you to check out the Jabra Elite 65t for yourself. On hand to assist would be sales assistants so that you can make the most of our Jabra demo experience. The three retailers include: All IT Hypermarket (IPC Shopping Centre, Digital Mall & Suria KLCC), Harvey Norman (IPC Shopping Centre, Sunway Pyramid & Pavillion) as well as through 11street.my. Those who pre-order are entitled to a whole bunch of freebies as part of this exclusive promotion. These include an exclusive, limited edition Jabra Elite Sport Towel plus a bonus free gift from participating retailers (All IT Hypermarket – Energizer 10,000MaH power bank worth RM139 & Harvey Norman – Sandisk Ultra Flair 32GB flash drive worth RM63). Engineered for superior sound, the Elite 65t brings together unique technological features to deliver best-in-class quality for voice and music. The innovative four microphone solution combined with an optimised acoustic chamber enables advanced noise suppression and voice enhancement for every type of environment. The earbuds also allows music to be personalised using a music equaliser accessed from the Jabra Sound+ companion application. For those who prefer to pre-order online, they may go to 11street.my which entitles you to a RM50 store credit, which can be redeemed for your next purchase. 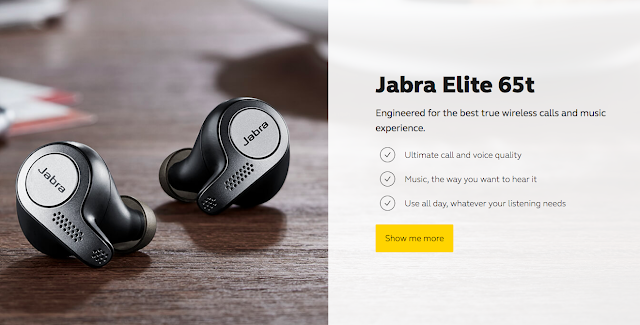 The pre-order retail price for the Jabra Elite 65t is RM799. All pre-orders will be ready by early April 2018.